With a poem, mystery and ambiguity can be often served best alongside brevity. H. D.’s “The Pool,” which supplies today’s words, is a fine example of this. It’s a condensed tale of an encounter that takes seconds to read, but longer to absorb. We last met H. D. (Hilda Doolittle) here with her tiny but fierce poem “Oread.” In that case, the title let us start off the poem knowing the main character of the poem. “The Pool” offers us no such clue with it’s somewhat generic title, and it throws us in the deep end by beginning with a question: “Are you alive?” Five spare lines later it ends still listing questions: “What are you..?” It’s called “The Pool,” but the unnamed thing in the pool seems the subject. H. D. with a more timeless look than her spouse. Go ahead, listen to the musical performance of “The Pool” now (the player is below), because encountering it in mystery is important. The poem is so short and yet multi-faceted, I repeat some of its words, extending the listener’s experience of the words a bit longer, encouraging you to not let go of them too fast. H. D. must have intended this to be mysterious. Various “solutions” have been suggested, though they would reduce the poem to a riddle. When I first read it, I assumed the object the poem’s speaker is questioning in the pool was a fish, taking the metaphor of it quivering “Like a sea-fish” literally—but would someone describe a fish as “like a fish?” Over at the always “Interesting Literature” blog a commenter suggested it could be H. D.’s unborn child, an ingenious solution, consistent with the quivering and the water and possibly with the “banded one” epithet for the object, if one thinks of the womb as a band. H.D. was pregnant for the first time in the year the poem was published, and if this is part of the poet’s intent, the opening question is achingly poignant, since that pregnancy ended in a miscarriage. 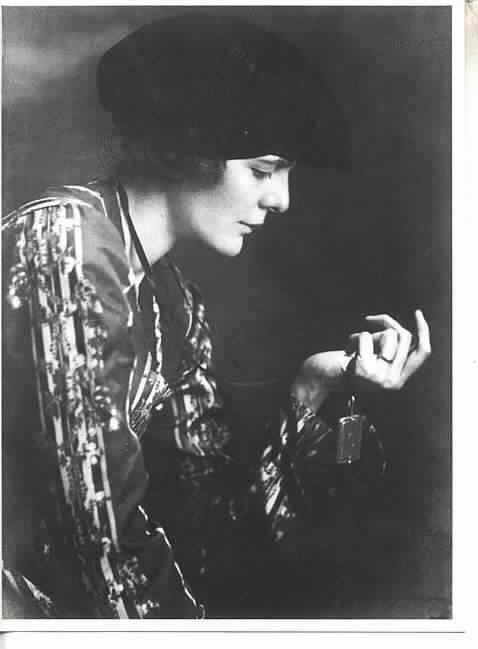 But if that is the largely intended experience to be drawn from the poem, H. D. has given us no internal clues in the words to lead us there without knowing now obscure biographical details regarding her life and the poem’s publishing date. Is that meaning there unintentionally? That’s certainly possible. The New Criticism writers assumed intent, honoring the artist, but modern Deconstructionists would find this a moot point. It wouldn’t even matter to them if H. D. had written the poem a year or more before it was published, before her pregnancy, as a reader could choose to experience the poem as about pregnancy with no intent on the part of the author. In the tiny amount of words in this poem, the net and the “banded one” are all that lead us away from Narcissus. Is this poem in fact a representation of a modern experience stated directly with no excess words in the manner of the Imagist credo? If so, what could one see in a pool that is banded and is like a fish. Some crabs have banded leg markings, that possibility exists, and the “I touch you” line takes on a new context if one imagines the crustacean strangeness and pincher-claw danger of touching a crab in a tide pool to see if it is alive. “I touch you”—or not. 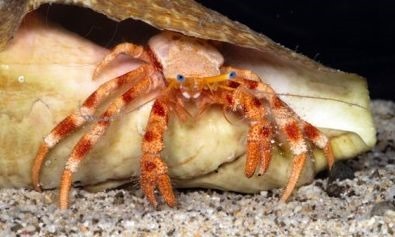 A banded hermit crab. Or the modern, direct experience could be intended as an echo of Narcissus, a moment when the speaker of the poem sees their reflection in water and assumes, as Narcissus did in the myth, that this thing in the pool is an entrancing other. And the net then, an expression of the inability to capture our selves. Interesting Literature suggests that the “banded” could be the net interrupting the reflection with its strands. An echo then of a Narcissus’ reflection, and Echo is the name of the nymph who tricked Narcissus into the reflection lock. That would explain why the poem isn’t called “Narcissus.” In this modern encounter, the speaker doesn’t lock forever in contemplation of the unknowable reflection, spending five lines there, aware of Narcissus’s plight. The net becomes the thing that, this time, breaks the spell. And what of the “banded one?” Is there a pun there? I didn’t see it reading the poem on the page, but my overlapping voices in the performance made the phrase sound like “abandoned one.” Narcissus wouldn’t abandon the entrancing reflection, and by extension, is bound by his attraction to his perception of himself. Perhaps H. D.’s “The Pool” is all of these things, perhaps even something else as well. Mystery and ambiguity is sometimes best served by brevity. Go ahead and listen to my performance of “The Pool” again, it may reflect something else.